Most travellers are aware of the fees associated with using their credit cards overseas. Depending on the card, you can expect to pay 1.0-3.5% in fees when you use your credit card in another country. the administrative fee imposed by the bank. These fees are usually disclosed by the issuing bank in the cardholder agreement. For example, the total fees for DBS issued credit cards are 3.0% for Visa/MasterCard and American Express (Amex) cards. However, what about the foreign exchange rates? In the disclosure above, the foreign exchange rate is said to be “determined by Visa / MasterCard / Amex”. Is this an additional fee? How can we avoid, or at least minimise this "fee"? It is important to understand this because the exchange rates provided by each card association can differ by 1-2%, meaning you could pay S$10-20 extra for a S$1,000 transaction, on top of your credit card fees. 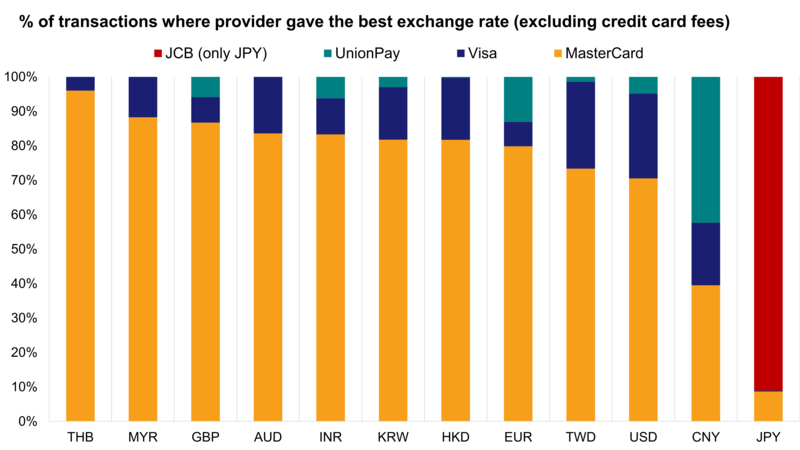 Our results show that all else being equal, you can expect to save ~0.5-1.0% on average with MasterCard as it generally provides better exchange rates than Visa and UnionPay across most currencies, at least 70% of the time. There are two exceptions; UnionPay and JCB generally give the best exchange rates for CNY/SGD and JPY/SGD respectively (no surprise there!). Note: This article only focuses on foreign exchange rates. Please include your card and bank specific benefits and fees in your overall assessment. How do card associations determine foreign exchange rates? Before we attempt to minimise the "costs" from the foreign exchange rate, let us first understand how card associations determine these rates on your credit card bill. Visa, MasterCard, Amex, and UnionPay calculate blended exchange rates from a range of sources such as wholesale currency markets or government-mandated rates, then make these rates available to the issuing banks. The issuing banks may then adjust the exchange rates further in your credit card bill. The rates from card associations are usually made available to the issuing banks one business day prior to the processing date. Thus, as a retail consumer, there is no way to know in advance the exact foreign exchange rates that will be applied to your overseas credit card transaction. Also, we previously established that you should always ask to complete your transaction in foreign currency (e.g. JPY) when using your credit card overseas, as paying in your billing currency (SGD) could leave you with a 3-15% higher transaction amount. This means that you won’t know the exact exchange rate at the point of purchase, but only until after you check your credit card statements. So then, how do we then determine which card association provides the best exchange rates? While we can’t check the exact applicable exchange rates from each card association at the point of transaction, we can let history guide us. We tracked the SGD rates against different currencies from Visa, MasterCard, UnionPay, and JCB on every available transaction date for the past two years. While Amex does not publish any indicative foreign exchange rates for SGD denominated cards, anecdotal evidence suggests that Amex’s rates were generally quite close to Visa’s (but don’t quote us on this). Here's a comparison of the JPY/SGD exchange rate for the past year from the four card associations. As a reminder, the higher the number (the higher the line in the chart), the more JPY you receive per unit of SGD. 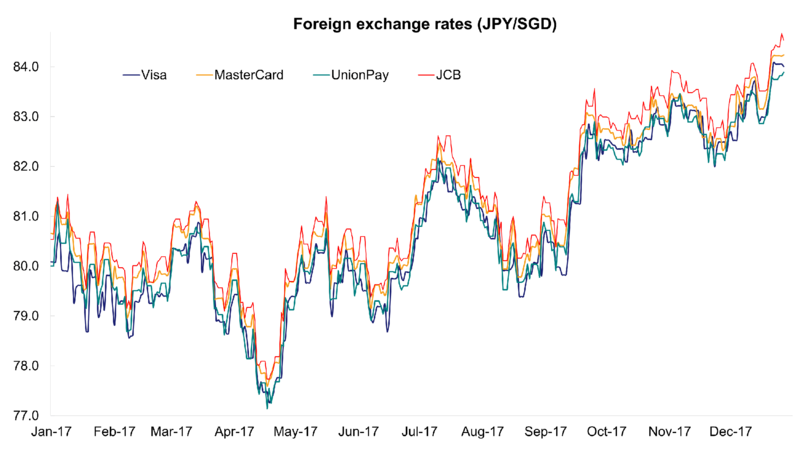 JCB (red line) provided the best JPY/SGD exchange rate by far; ~0.8% better than Visa and UnionPay on average, and ~0.3% better than MasterCard on average for the past year, though the differences could extend to >2% on some days. Being a Japanese card association, it is not surprising that JCB would provide the best JPY exchange rates in general. Since JCB cards are not very widely issued in Singapore, the comparison for most consumers from Singapore would be between Visa and MasterCard, where the median difference was ~0.5%. Of course, this varies at different time periods. For example, the median difference extended to 0.7-0.9% between Sep-16 to Jan-17, and 0.8-1.1% in Sep-17, even extending to >2% on some periods. Who has the best exchange rates? Apart from JPY, we also tracked 11 other currencies against the SGD. For each transaction date, we compared the exchange rate from each card association to find out who gave the best rate on that day. We excluded results from JCB in the overall analysis (except for JPY/SGD) as JCB cards are not widely issued in Singapore. Here's how the chart can be read; using KRW as an example, over the past year, MasterCard provided the best KRW/SGD ~82% of the time, Visa provided the best KRW/SGD ~15% of the time, and UnionPay provided the best KRW/SGD ~3% of the time. Overall, the results are quite clear; even though exchange rates fluctuate and there are many variables involved (details such as transaction vs. posting date, decimal rounding, etc. ), MasterCard generally provided the best exchange rates across these currencies in the past year, at least 70% of the time. Does this mean that you should always use a MasterCard card when you’re overseas? All else being equal (leaving aside card fees/rebates/benefits), MasterCard does generally provide the best exchange rates for the cardholder. But like we said, all else being equal. As a savvy consumer, you’ll probably have several credit cards at your disposal. Are the benefits from your other cards more than the median exchange rate difference? What about the respective fees for each of your cards? Are there card-specific promotions going on? Will you be achieving the minimum spend that month to qualify for a higher rebates tier? These factors vary significantly by situation (even valuing a mile is subjective), so we won’t go into the details here. In most cases, the card or bank specific rebates and fees matter more than the foreign exchange rate difference amongst card associations. Assess the card and bank-specific benefits/rebates and costs first, then factor in the foreign exchange difference.